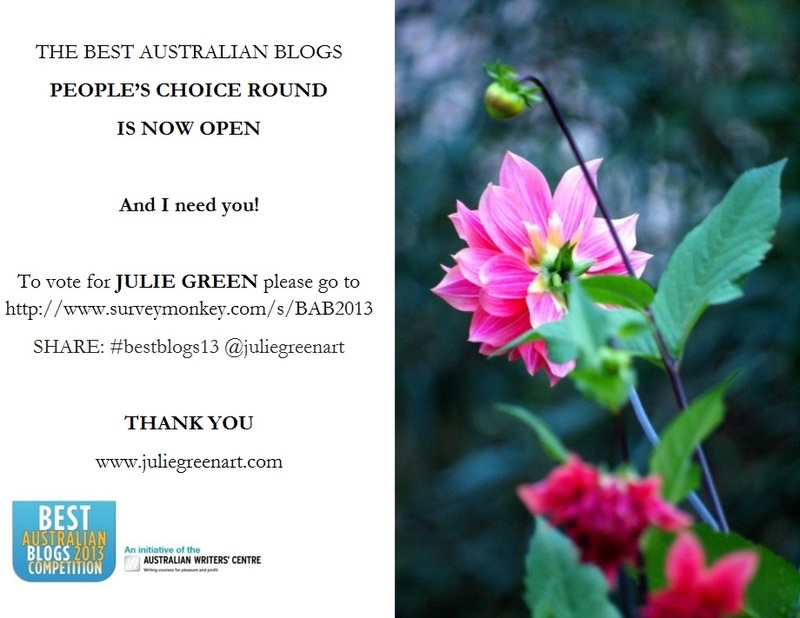 Your kindness and encouragement never goes astray, but I want to ask if you’d vote for me in the People’s Choice Round for The Best Australian Blogs Competition. You have no obligation to do so. The blogging community astounds me and sets my heart on fire, so thank you, that’s why I entered. And hey, guess what? You could even help to improve my writing if I won the prize of $1,000 in writing courses. We all benefit then. For technicalities: you’ll find JULIE GREEN on Page 2 following the button below or using the link here. And if you’re feeling generous enough, please share. I will send all my loving and gratitude your way. Voted for Green! Hi Julie, I wish you lots and loads and hips of votes! Visualize and manifest! Thank you!! I will write, write, write! You too. Thank you so much – you’re a wonder!